Editor’s note: This story is reprinted from the February issue of GCU Magazine. To view the digital version of the magazine, click here. 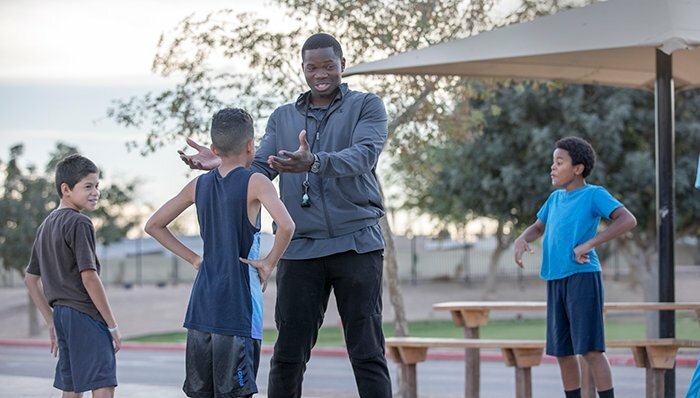 Jerome Garrison was working out in Phoenix for another professional basketball season in Spain when a job notice popped up on an education database he joined a year earlier as a Grand Canyon University student. That led to an interview with a privileged Gilbert, Ariz., school that boasted every amenity. He also visited a Scottsdale school where he saw students, heads down, their eyes fixated on their phones. He couldn’t leave soon enough. “Why would I leave playing for this?” Garrison thought. But then he met 870 children who needed him. 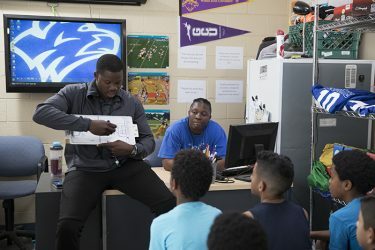 The morning after talking to Imagine Avondale staff about being the charter school’s athletic director and physical education teacher, something became clear to him: The elementary and middle school needed a gymnasium. Garrison, 25, has been unrelenting in that vision. He shares it with students. He meets prospective donors. He started a GoFundMe page with a $70,000 goal. He decorated his office wall with a sign reading “ONE DAY …” above six renderings of the gym he wants to put in place of the school’s outdoor court. It is his vision board, an idea that germinated in his 2012 recruiting visit to GCU President Brian Mueller’s office. He recalls how Mueller’s wall featured visionary pictures of what are now campus fixtures – including GCU Arena, where he played two of his four Lopes seasons. Each school day at Imagine Avondale begins with Garrison arriving at the entrance 40 minutes before the opening bell to greet each student. From sunup until he plays outside with them after sundown, he wants to make sure each child feels like a star. Garrison did not imagine he would work in education even though he graduated with a bachelor’s degree in the field. He majored in education at the urging of his father, a South Mountain Community College division chair. “You’re a teacher,” Dr. Jerome Garrison told his son. “You just don’t know it. You love people.” His Imagine Avondale office, once a disheveled room of broken equipment, displays his belief in the students and their affection for him. Now organized with new uniforms, mostly new equipment and bags of donated shoes, Garrison has posted inspirational sayings he repeats to students. Garrison scored 1,265 points in his career, which ranks eighth in Grand Canyon history. The students do not have many advantages they can use to profess their belief in those principles, but it’s why Garrison was attracted to the campus, surrounded on three sides by a mobile home park in an otherwise industrial area. Every elementary student is on a reduced-price lunch program, and 75 percent of the middle school students are on it. About 40 percent of students come from single-parent homes; eight students are homeless. “I never knew how one person could make so much difference, and you showed me I could be that one for my family,” one student told him last semester. Garrison can’t wait to see his students each day. The feeling is mutual. “He’s a bigger-than-life person in this marketplace setting,” Mueller said. After visiting the Imagine Avondale campus, Mueller brought the students to campus for a basketball game. When the fall semester ended with a festival, the student body presented Garrison with a gift basket filled with balls autographed by students and gift cards. A second-grade girl came to his office with a quart-size plastic bag full of pennies, nickels, dimes and quarters. She had saved money for the gym since Garrison introduced the idea. Garrison expanded the athletic program from six teams last year to 18 teams, including dance and cheer. Every athlete has stayed eligible this school year after 60 of 190 athletes failed to meet his eligibility standard of a 2.5 grade-point average last year. In his GCU classrooms, he always was reminded to find his purpose and passion. He thought it was basketball until he met Imagine Avondale kids and his mother was diagnosed with stomach cancer.